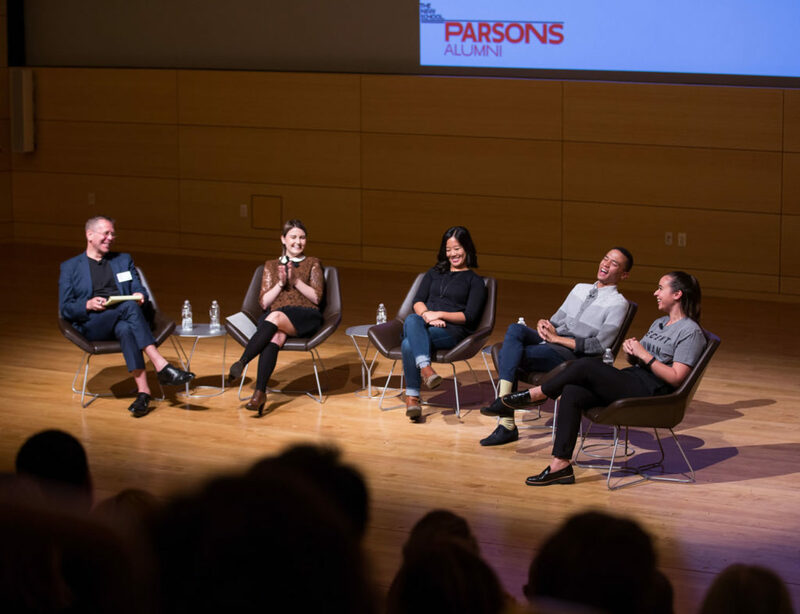 Socially engaged designers circled back to their alma mater for a discussion of their work at #ParsonsReunion. When Sophia Sunwoo came to Parsons School of Design at The New School, she expected her professors to teach her about accomplished designers who are changing the world. Instead, they taught her that she could change the world. Now Sunwoo is helping to bring sustainable water systems to the developing world — an effort that is positively impacting the lives of people across Africa. Sunwoo made her remarks to the alumni gathered for #ParsonsReunion, the leading art and design school’s annual celebration of its graduates and their accomplishments. Now in its sixth year, the event was an opportunity for alumni of all years and disciplines to network, share their success stories, and showcase their work — this year in Loop, an immersive interactive exhibition housed at Parsons’ new state-of-the-art Making Center. It was also an opportunity for alumni to marvel at the dramatic changes to their alma mater, most notably the creation of the Making Center. Completed with major support from the Kay Unger Family Foundation, the center is a space in which students and faculty members can explore innovative manufacturing methods, collaborate with their peers across disciplines, and employ cutting-edge tools to address pressing social needs related to sustainability, human well-being, and the revival of urban making. Following tours of the facility in the afternoon, alumni crossed Fifth Avenue to Tishman Auditorium for Branching Out: Alumni Design New Paths To Success, a panel in which Sunwoo; Nelson De Jesus Ubri, BFA Architectural Design ’15; Lucy Jones, BFA Fashion Design ’15; and Angela Luna, BFA Fashion Design ’16 discussed their socially engaged work. Later that evening, alumni circled back to the Making Center for a reception featuring music, DIY screenprinting, and hors d’oeuvres. Sunwoo shared her experience as the co-founder of Water Collective, an organization that aims to resolve the shortage of clean water access in the developing world. In developing sustainable water systems, Water Collective doesn’t rely on “fancy tech solutions”; rather, Sunwoo said, “we go back to the human-centered aspect,” exploring bottom-up solutions that emerge from local ecologies, economies, cultures, and institutions. Jones, the 2015 Womenswear Designer of the Year, discussed her experience designing Seated Collection, a fashion line that allows self-propelled, seated disabled people to independently dress themselves. De Jesus Ubri, the recipient of a Fulbright Academic Research Grant, talked about his efforts to study and address the effects of hurricane disasters in the Dominican Republic. And Luna, the 2016 Womenswear Designer of the Year, shared insights on Adiff, her fashion line consisting of outerwear pieces that serve life-saving functions for refugees. In addition to being socially engaged, Parsons alumni are entrepreneurial. Towers noted that, in transitioning from the academic to the professional realm, Sunwoo, Jones, De Jesus Ubri, and Luna had “sidestepped traditional pathways to acquiring new knowledge,” such as working for established companies or pursuing apprenticeships. “You guys have blown past that,” he said, adding that many alumni were pursuing careers on their own terms. The alumni said that while they may have forged their own professional paths, they weren’t traversing them alone. “I listen to, learn from, and collaborate with other people every single day,” Jones said. At the conclusion of the talk, Kay Unger, a Parsons alumna and fashion designer who went on to become the chair of the Parsons Board of Governors, captured the feeling in the room.